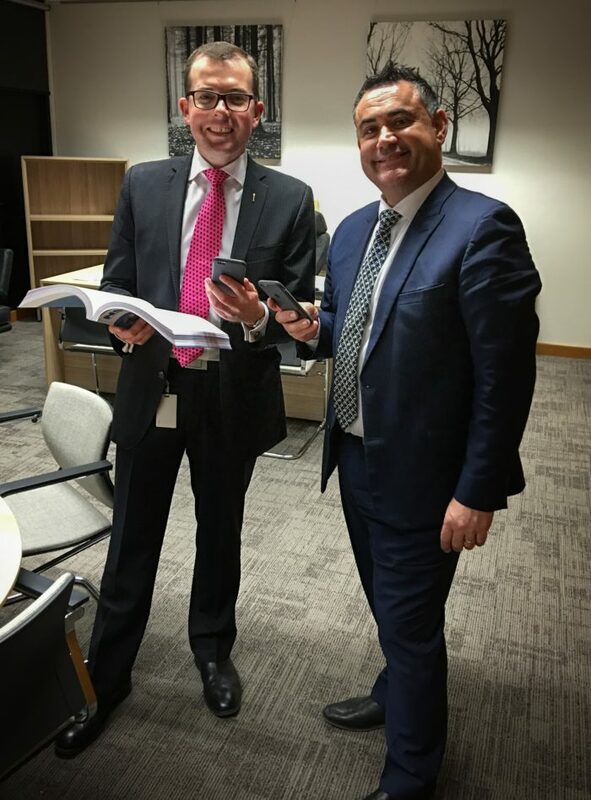 Northern Tablelands MP Adam Marshall with Regional Development Minister John Barilaro after the $15 million Mobile Black Spot contribution was announced in yesterday’s NSW Budget. THE commitment of another $15 million to the Federal Government’s Mobile Black Spot Program in yesterday’s 2016-17 NSW Budget has been warmly welcomed by local State MP Adam Marshall. “As someone who is constantly travelling the length and breadth of the Northern Tablelands electorate, I know only too well how many holes there are in our mobile coverage,” Mr Marshall said. The new $15 million contribution to the Black Spot program was announced yesterday by Minister for Regional Development and Small Business John Barilaro. “The NSW Government has already committed $24 million to round 1 of this program, which will fix 795 mobile phone black spots and deliver 144 new or upgraded mobile base stations that will cover more than 14,000 square kilometres,” Mr Marshall said. Mr Marshall said in the first round, nine new mobile phone towers were announced for the Northern Tablelands electorate with the first being commissioned west of Glen Innes just before Christmas. The new Telstra tower at Hillgrove has also been switched on, providing a service to customers from this morning.